The Site is intended for use in the United States by individuals 13 years of age or older. If you are under 18 years of age, you may use this Site only with the permission and involvement of a parent or guardian. If you are located outside of the United States, you may use the Site only at your own risk, and you are responsible for complying with all local laws, rules and regulations. Springs Beer Tours grants you a limited license to access and make use of the Site and the Content only for your personal, non-commercial use, and only to the extent such use does not violate these Terms & Conditions You may download, print or copy Content and other downloadable materials contained on the Site for your personal, non-commercial use only, provided that you do not modify or alter the Content in any way and do not remove or change any trademark or copyright notice. No right, title or interest in any Content is transferred to you as a result of your access or any downloading, printing or copying by you. Springs Beer Tours reserves the right to, at any time: (i) modify, suspend or discontinue the Site or any portion of the Site; (ii) charge fees in connection with your use of the Site and/or modify or waive any such fees; and/or (iii) offer opportunities to some or all users of the Site. You agree that we shall not be liable to you or to any third party for any modification, suspension or discontinuance of the Site. Springs Beer Tours is pleased to hear from users of our Site and we welcome reviews, comments and other communications regarding the Site and our products (“User Content”), provided that the User Content complies with these Terms & Conditions. You hereby grant to Springs Beer Tours a non-exclusive, perpetual, irrevocable, royalty-free, transferable, sub-licensable right and license to use, display, distribute, transmit, copy, modify, delete, publish, translate, create derivative works from and sell the User Content that you provide. Springs Beer Tours can incorporate the User Content that you provide into any form, medium or technology, now known or hereafter developed, throughout the world, all without compensation to you. You should not provide Springs Beer Tours with any User Content that includes confidential information or any original creative materials (such as product ideas or original artwork), if you do not wish to grant the foregoing license to such information or materials to Springs Beer Tours. 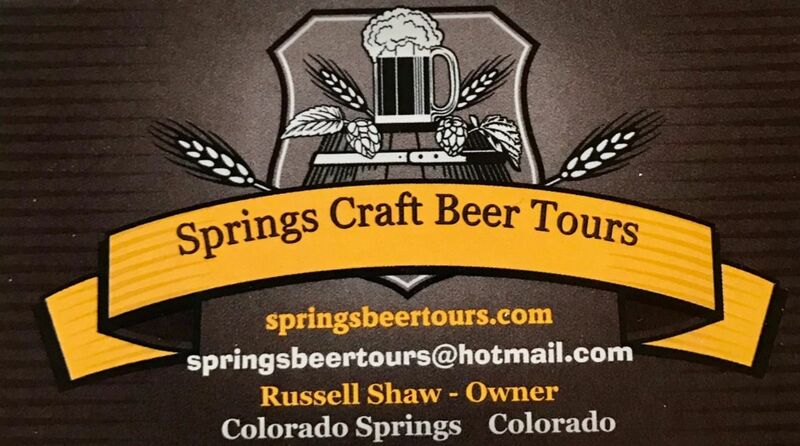 Springs Beer Tours may, but is not required to, include your name along with the User Content submitted by you. Other Site users may post User Content that is inaccurate, misleading or deceptive. Springs Beer Tours neither endorses nor is responsible for any information, opinions or statements made by third parties on the Site. Springs Beer Tours will not be liable for any loss or damage caused by your reliance on such information, opinions or statements. Springs Beer Tours reserves the right, without notice and in its sole discretion, to terminate your account or your use of the Site and to block or prevent your future access to and use of the Site for any reason or no reason at all. Upon any such termination, your account and/or your right to access and use the Site will immediately cease. The products displayed on the Site are available in the United States. The prices displayed on the Site are in U.S. Dollars. All photos, descriptions, images, features, content, specifications and prices of products described on the Site are subject to change at any time without notice. If you wish to purchase any product available through the Site, you must supply certain information relevant to the sales transaction, including but not limited to your name, credit card number, expiration date and security code for your credit card, your billing address and your shipping address. You hereby represent and warrant that you have the legal right to use the credit card that you provide in connection with the sales transaction. By submitting the foregoing information, you grant to Springs Beer Tours the right to provide that information to third parties for purposes of facilitating the completion of the sales transaction. Occasionally there may be information about products, pricing or promotions on the Site that contains typographical errors, inaccuracies or omissions. Springs Beer Tours reserves the right to correct any errors, inaccuracies or omissions and to change or update information or cancel orders if any information on the Site is inaccurate at any time without prior notice (including after you have submitted an order). YOUR USE OF LINKED WEBSITES IS AT YOUR OWN RISK. Springs Beer Tours does not represent or warrant that the Site and/or your access thereto will be uninterrupted or error-free, or that the Site will meet your expectations or requirements. THE SITE AND ALL Springs Beer Tours -PROVIDED CONTENT, MATERIALS, PRODUCT INFORMATION AND PHOTOS, AND ANY USER CONTENT MADE AVAILABLE TO YOU THROUGH THE SITE, ARE PROVIDED ON AN “AS IS, AS AVAILABLE” BASIS, WITHOUT REPRESENTATIONS OR WARRANTIES OF ANY KIND, EITHER EXPRESS OR IMPLIED. BY WAY OF EXPLANATION AND NOT LIMITATION, Springs Beer Tours, MAKES NO REPRESENTATIONS OR WARRANTIES AS TO THE OPERATION OF THE SITE Springs Beer Tours, THE ACCURACY OR COMPLETENESS OF THE CONTENTS OF THE SITE, OR THAT COMMUNICATIONS SENT THROUGH THE SITE WILL BE TRANSMITTED OR COMPLETE. YOU HEREBY ACKNOWLEDGE AND AGREE THAT YOUR USE OF THE SITE IS AT YOUR SOLE RISK. TO THE FULL EXTENT PERMITTED BY LAW, Springs Beer Tours DISCLAIMS ANY AND ALL REPRESENTATIONS AND WARRANTIES WITH RESPECT TO THE SITE AND THE SITE CONTENTS, WHETHER EXPRESS OR IMPLIED, INCLUDING BUT NOT LIMITED TO, WARRANTIES OF TITLE, MERCHANTABILITY, FITNESS FOR A PARTICULAR PURPOSE OR USE AND NON-INFRINGEMENT. NONE OF Springs Beer Tours, ITS OFFICERS, DIRECTORS, EMPLOYEES OR AGENTS WILL BE LIABLE FOR ANY DIRECT OR INDIRECT DAMAGES OR LOSSES OF ANY KIND ARISING OUT OF OR IN CONNECTION WITH YOUR USE OF OR INABILITY TO USE THE SITE, OR ANY OF THE SITE CONTENTS. THIS LIMITATION OF LIABILITY APPLIES TO ALL DAMAGES AND LOSSES OF EVERY KIND, INCLUDING BUT NOT LIMITED TO, DIRECT, INDIRECT, SPECIAL, PUNITIVE AND CONSEQUENTIAL DAMAGES, WHETHER ARISING IN CONTRACT OR TORT, AND EVEN IF Springs Beer Tours HAS BEEN ADVISED OF OR SHOULD HAVE KNOWN OF THE POSSIBILITY OF SUCH DAMAGES. If you’re not 100% satisfied with your purchase for any reason, just mail the merchandise back within 30 days of purchase and, we will replace it or refund your money with no questions asked. Refunds must be refunded to the original payment method. If that is unavailable, we will give you online store credit. Refunds to a credit card may take up to a week to process depending on your bank. You are responsible for the return shipping, and all shipping charges are non-refundable. Once we have received the return, we will process it within 7 days. Your refund will be credited back to the original method of payment used to place the order. If that is unavailable then you will be refunded to an online store credit. Returns over the 30 day limit will get an online store credit. Refunds may take an additional 5-7 days depending on your bank. We will notify you by email at the email address you used to place your order when we process your refund. You hereby agree to defend, indemnify and hold harmless Springs Beer Tours and its officers, directors, employees and agents from and against any and all liabilities, losses, claims, suits, damages, costs and expenses (including reasonable attorneys’ fees), arising from or related to your use of the Site, including but not limited to any User Content that you submit and/or your breach of any representation, warranty, or other provision of these Terms & Conditions. Springs Beer Tours is not an agent, representative, or employee of any pub, bar or restaurant visited on the tours. Springs Beer Tours clients/customers comments and opinions with regard to locations visited are their own and not the opinions of Springs Beer Tours. YOU HEREBY ACKNOWLEDGE AND AGREE THAT ALL MATTERS RELATING TO YOUR ACCESS TO OR USE OF THE SITE AND ALL MATTERS ARISING OUT OF OR RELATED TO THESE TERMS & CONDITIONS WILL BE GOVERNED BY AND CONSTRUED IN ACCORDANCE WITH THE LAWS OF THE STATE OF [COLORADO], WITHOUT REGARD TO ITS CONFLICT OF LAW PROVISIONS. THE EXCLUSIVE FORUM AND VENUE FOR ANY LEGAL ACTIONS OR DISPUTES ARISING OUT OF OR RELATED TO THESE TERMS & CONDITIONS SHALL BE THE STATE AND/OR FEDERAL COURTS LOCATED IN [EL PASO COUNTY, COLORADO], AND YOU HEREBY SUBMIT TO THE PERSONAL JURISDICTION OF THOSE COURTS. You may cease accessing the Site at any time. Springs Beer Tours may terminate your access to the Site at any time without notice, for any reason or no reason at all. You agree that Springs Beer Tours shall not be liable to you or any third party for its termination of your access to the Site. Upon termination, all provisions of these Terms & Conditions which are by their nature intended to survive termination, all representations and warranties, all limitations of liability, and all indemnification obligations shall survive such termination. Springs Beer Tours respects the intellectual property of others, and our policy is to respond to notices of alleged infringement that comply with the Digital Millennium Copyright Act (“DMCA”). 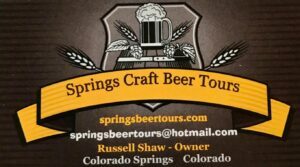 If you believe that your work has been copied in a way that constitutes copyright infringement, please provide Springs Beer Tours’s copyright agent with the written information specified below, by regular mail, fax email only. When Springs Beer Tours receives a valid DMCA infringement notice with the information listed above, we will respond by either: (i) taking down the allegedly infringing content or (ii) blocking access to it. Springs Beer Tours will also take reasonable steps to notify the user who posted the allegedly infringing content, who may then respond to your claim through the counter-notification procedure. Anyone submitting a false or fraudulent notice may be liable for damages under the DMCA, including costs and attorneys’ fees. Any person who is unsure of whether certain material infringes a copyright held by such person or a third party should contact an attorney. The Springs Beer Tours app may not work with all devices or all wireless carriers. Springs Beer Tours makes no representations or warranties that the Springs Beer Tours app will be compatible with all wireless carriers. If you have any questions regarding these Terms & Conditions, please contact us by email at SpringsBeerTours@hotmail.com.